We don’t get Hulu in Canada, but good news for March Entertainment, getting an outlet like that to carry their show. Shows that there’s life after broadcast. Duopoly announces the U.S. launch of the groundbreaking, web-to-TV animated comedy series Chilly Beach, now streaming on Hulu.com and the Hulu Plus subscription service at http://www.hulu.com/chilly-beach. Produced by March Entertainment for Canada’s CBC, the series ran over three seasons, garnering a large and enthusiastic following through a combination of broadcast play and the dynamic, interactive website www.chillybeach.com. Chilly Beach (65×22’) follows the adventures of the quirky residents of an obscure Canadian resort village and in particular, Dale and Frank, two beer-loving, hockey-playing best friends who have spent their whole lives largely oblivious to the outside world. It also follows Abby, the young, precocious expatriate American, who finds life in this unfamiliar land both incomprehensible and fascinating. Featuring stand-out performances by Steve Ashton and Dwayne Hill, the show also boasts guest performances from William Shatner, Joe Flaherty, Leslie Nielsen, Elvis Stojko, Lawrence Gowan, and David Suzuki. Completing the Chilly Beach lineup on Hulu.com and Hulu Plus, are the two original movies released after the TV series. Chilly Beach: The World is Hot Enough follows the clueless pair’s adventures into a deadly world of international intrigue, corruption, and espionage after they inadvertently attract the attention of the U.S. Secret Service while attempting to build a climate-altering machine. In Chilly Beach: The Canadian President, Dale finds himself chosen to be the puppet President of the United States. It’s a true political satire that uses slapstick to skewer the keystone of Canadian identity. 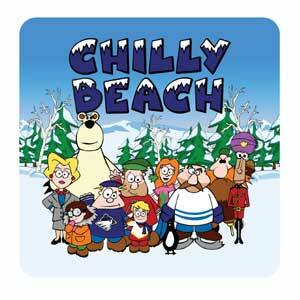 Both the Chilly Beach television series and movies were created by March Entertainment, an award-winning production company that specializes in comedy, animation, and multimedia. Chilly Beach has been nominated for one 2005 Writers Guild of Canada Award and two 2004 Gemini Awards for Best Original Score and Best Interactive. Duopoly is an independent film, television and multi-platform content company founded in 2002. Recent Duopoly productions include the GeminiAward-winning comedy series Pure Pwnage for Showcase and the original comedy web series Papillon, starring Kevin McDonald, soon to be released on BiteTV. Duopoly is a content partner for Hulu and most recently launched the award-winning animation series Odd Job Jack on the platform. Hulu is an online TV service whose mission is to help people find and enjoy the world’s premium content when, where and how they want it. Hulu.com is a free ad supported service for users to watch their favorite TV shows on personal computers. For $7.99/month, Hulu Plus subscribers have access to Hulu’s deep library of current and back season TV shows in HD on select connected TV, blue-ray players, connected set-top boxes, gaming consoles and mobile devices. This entry was posted on Monday, May 9th, 2011 at 12:09 pm	and is filed under News. You can follow any responses to this entry through the RSS 2.0 feed.